One of the new feature in Windows is the Jumplist. It contains the most recent items that have been opened and the program functions. The recent items that are displayed can be a security and privacy risk. There is no shortcut or easier way to delete all items at once but you still can clear it with these simple steps. 2. On the address bar, copy and paste the following URL. 3. 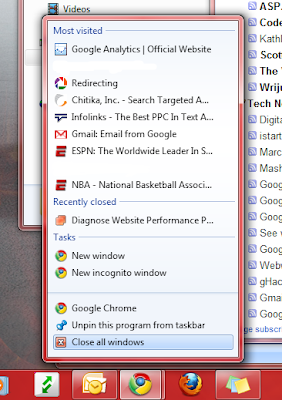 The Windows Explorer should show you the recent jumplists items. Although there is no way to identify which file correspond to a specific jumplist, you can try by opening each file using a Text Editor. 4. To clear all recent items, just delete all items on the directory.